Interactive sound installation, Breaking Eyes, Nordic Arts Centre, Sveaborg, Helsinki, Finland, 1996. Sveaborg is an idyllic island with virtually no traffic. To go to Sveaborg a visitor or a resident has to take a ferry from Helsinki harbor. The ferry departs once every hour and takes 10-15 minutes. The main entrance to and exit from the island is a tunnel. 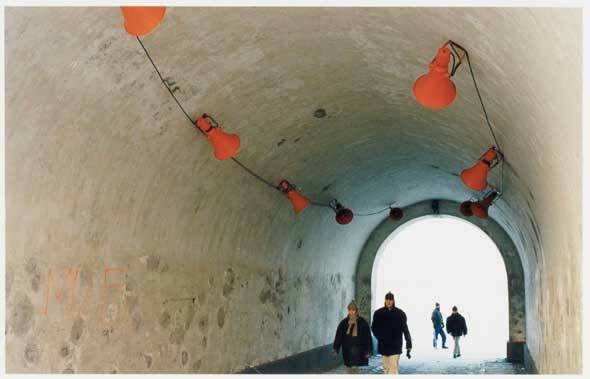 In the ceiling of this tunnel the nine orange megaphone speakers were mounted forming an ellipse. On the ground there were a dotted circle in the middle of the tunnel. An IR-detector connected to the three control boxes is "watching" the circle. By entering the circle the visitor transforms the space to a traffic zone. By leaving the circle, the visitor removes the sound chaos within 0.5-2s. This is an improvement compared to the installation in Oslo. "Traffic Zone" can be experienced from the inside by the pedestrians who interact with the piece as well as from the outside by an observer. The observer gets an overview of how the installation engages, by force, the environment to be part of the installation; the passing pedestrians are transformed to vehicles.